SHOULD I SEE A PHYSICAL THERAPIST FIRST? CAN I SEE A PHYSICAL THERAPIST DIRECTLY FIRST? 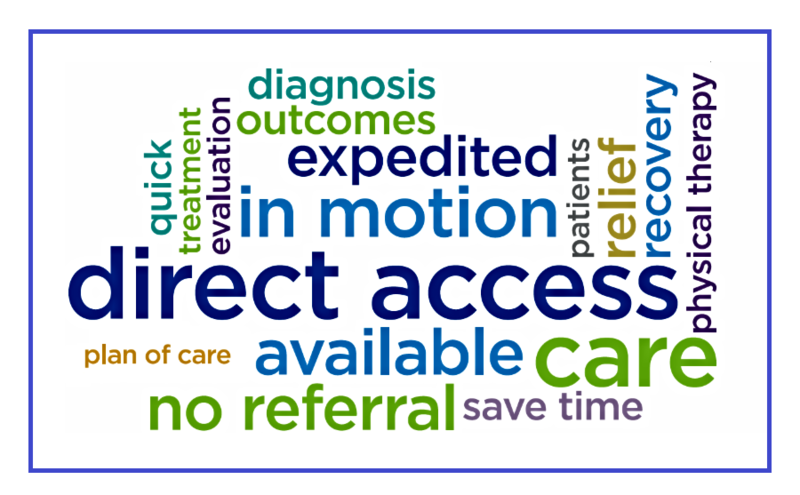 In the State of Illinois, you have direct access to physical therapy services without a referral or a prescription. There are many reasons to see a physical therapist first for your musculoskeletal injury. Physical therapists are highly trained in evaluating orthopedic injuries and providing direct treatment in the vast majority of cases. Unless there is a fracture that is suspected or surgery is needed, it is unlikely that you would need X-rays or an MRI right away. You would more than likely benefit from a course of physical therapy first. This was the rationale for the new law passed in Illinois to increase direct access to physical therapy. The law, effective August 16, 2018, permits physical therapists to evaluate patients and determine a treatment plan without first having to submit a diagnosis for a health care professional’s approval, speeding the path to relief and healing. The new law allows consumers to pursue and begin physical therapy services without a doctor’s referral while still ensuring professional medical oversight safeguards. Being able to see a physical therapist first has been found to decrease opioid use and it decreases the overall costs to the patient and society. According to a recent BlueCross BlueShield of South Carolina study, direct access to physical therapy led to a 31-percent reduction in total health care costs, 80-percent decrease in patient out-of-pocket costs and a 90-percent reduction in opioid use. A Health Services Research study also noted 27 percent of patients who visited a physical therapist directly for outpatient care had fewer visits and lower overall costs. Physical therapy is a cost-effective treatment designed to get you back on your feet quickly, and with lasting results. Not only do most insurance providers cover physical therapy, it has been proven to reduce medical costs by diminishing the need for unnecessary medication, imaging scans, or surgeries. Seeing your physical therapist first can reduce the total cost of care by 50%. If you’re in pain, your first instinct is likely to pay a visit to your primary care physician, who may then refer you to an orthopaedic specialist, who will write you a prescription for physical therapy. However, a 2017 Merritt Hawkins study showed that the average wait time to see a physician is 24 days, up 30% from 2014. That process alone can set you back a few insurance co-pays, not to mention a couple of weeks of delayed treatment. Heading directly to your physical therapist saves money – the right physical therapy within 14 days of the onset of pain minimizes the average total cost of care by 50%. 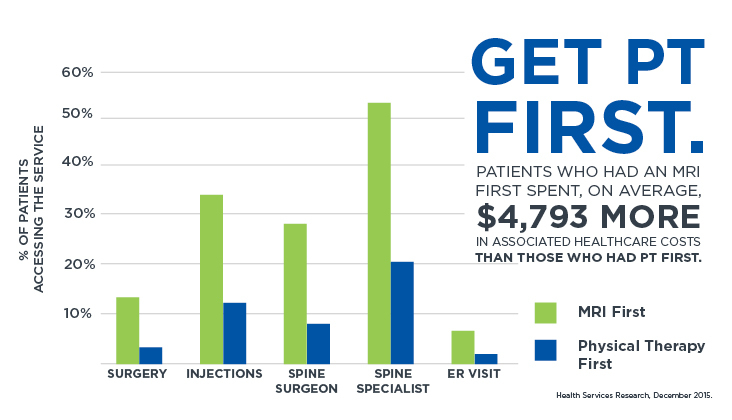 Low back pain patients who receive physical therapy immediately after the pain begins and adhere to their treatment plan spend $3,000 a year in associated healthcare costs. Those who delay receiving physical therapy and do not adhere to their treatment plan spend $6,000 per year on all kinds of healthcare. A study published in the Journal of the American Board of Family Medicine found that the patients who were sent to a physical therapy consult were 35% less likely to be prescribed opioids, even if they didn’t keep up with physical therapy after the initial evaluation. In addition, federal legislation was passed earlier this year that removes annual caps on how much Medicare pays for physical therapy. Previously, there was an arbitrary cap that limited patient's access to physical therapy without taking into consideration multiple injuries, body regions, or surgical interventions. As of Jan. 1, 2018 Medicare beneficiaries are eligible for physical therapy indefinitely as long as certain requirements are met. Contact Emery Physical Therapy in Mt. Prospect today to see if physical therapy would be beneficial in aiding you in your musclokeletal pain or injury. Out experienced staff is able to treat a variety of different conditions effectively. Give us a call at 847-786-2014 or make an online appointment today.